Not every sewing project works out well. 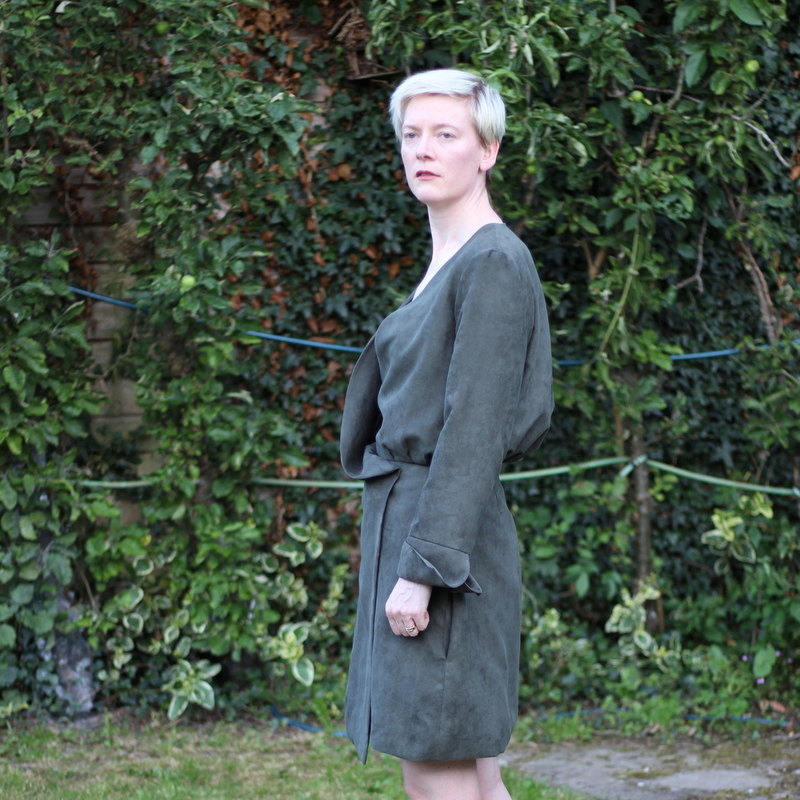 Here is a recent failure: Vogue 1268 in green fake suede fabric. You might be thinking it’s pretty strange to make a long-sleeved, lined, polyester dress in summer and you’d be right. Not all stash-busting is a good idea. And that was only the first mistake. V1268 is a Guy Laroche designer pattern that came out a few years ago. The envelope photo is below. It’s got an unusually baggy top half, and all the reviews of the pattern that I’ve found mention that the bodice runs very long. After reading the reviews I checked the back length on the pattern tissue. It has a handy marking to show how much blousing there’s meant to be, and it’s a very generous amount. If you remove the blousing allowance then the back length matches the Vogue measurement chart, to which I’d normally add 5cm, but given the reviewers’ comments I left the bodice length alone and added about 5cm to the skirt length instead. I also added side seam pockets, hem facings, and tweaked the lining pattern so I could do a bagged lining with the skirt lining completely attached to the hem and front facings. The original dress has a raw hem on the shell fabric and the lining is hemmed separately and attached to the dress at the front facings and waist seam. Here’s the back view. I didn’t do a good job on pressing the hem but let’s ignore that for now. There’s a bit of pulling at the back hip which I notice is present on Vogue’s model too. The waist is close-fitting. I made my usual size (for Vogue this is one size down from what the size chart indicates) and while it’s not uncomfortable there isn’t a lot of expansion room at the waist. I probably should have traced a size bigger. This seems to be happening more and more with Vogue for me despite checking the finished garment measurements before cutting. But overall the back isn’t bad. But now look at it from the side. The right bodice front is much too long and sags unattractively over the waist seam. There is no sign of this in the pattern photo, but the model’s shoulders are amazingly square. Could there be shoulder pads in there? I could swear the pattern doesn’t mention them. It might explain why the sleeves are a bit longer on me than the model too. I thought about trying to take up the extra length at the waist seam but the slanting shape of the right skirt front means this involves losing width in the wrap, and I really don’t like wrap dresses with a skimpy overlap. I finished the dress in the hope that it would be wearable in the end despite the bodice, but I’m pretty dubious now I’ve tried it on. On the good side: my bagged lining worked perfectly. Behold the entirely machine-finished hem/facing/lining junction! And just ignore the lack of pressing. There are other good things about this make. 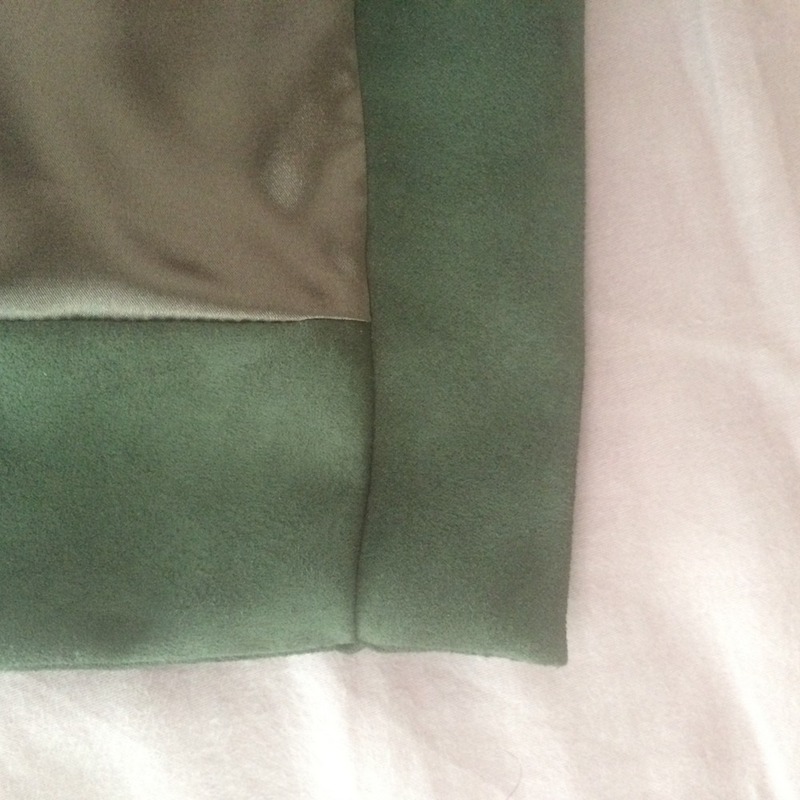 The sleeves went in easily, which was good because the fake suede does not like to be eased, and they are comfortable to wear with a good range of motion. I like the cuffs too. In fact if I’d shortened the bodice front on the pattern in advance I think I’d be really pleased with the result. I’m going to hang onto the dress until the autumn as I don’t think I’ll know how truly wearable it is until cold weather comes along. My hopes are not high but perhaps the magic wardrobe will transform it in the next few months.